Lovage plants (Levisticum officinale) grow like weeds. Fortunately, all parts of the lovage herb are usable and delicious. The plant is used in any recipe that calls for parsley or celery. It has a high salt content, so a little will go a long way but the stalks and stems are best used in carbohydrate-based dishes such as pasta and potato recipes. All parts of the herb are useable. The leaves are added to salads; the root is dug up at the end of the season and used as a vegetable. Stems can replace celery and the flower yields an aromatic oil. Interestingly, the lovage herb is a commonly used flavoring for confectionaries. You can use seeds and stems in candy making. The seeds are a common ingredient in flavored oils and vinegars, which steep in the liquid, releasing their flavor over time. Lovage herb is most commonly used in Europe where it flavors foods in Germany and Italy. Lovage looks a bit like celery but is in the carrot family. The plants may grow up to 6 feet and bears lacy thick green foliage. The flowers are yellow and held in umbrella-shaped umbels. They grow 36 to 72 inches with a 32-inch spread. The base of the plant is comprised of thick, celery-like stems with glossy green leaves that decrease in number as you move up the stalk. The yellow flowers are arranged in umbel type clusters, which produce seeds 1/2 inch long. Sun and well-drained soils are the key to growing lovage. Growing lovage requires soil with a pH of 6.5 and sandy, loamy soils. Lovage plants are hardy to USDA plant hardiness zone 4. 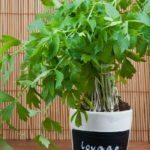 Determining when to plant lovage is the first step in growing the herb. Direct sow lovage seed indoors five to six weeks before the date of the last frost. Sow seed on the surface of soil and dust with sand. The seeds may also be sown outside in late spring when soil temperatures have warmed to 60 degrees F. (16 C.). Seedlings require consistent moisture until they are several inches tall and then irrigation may diminish. Transplant lovage plants 8 inches apart in rows 18 inches away from each other. Lovage will bloom earlier when planted indoors. 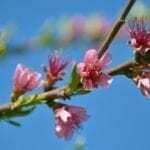 You can expect flowers on transplanted plants in early summer that last until late summer. Leaf miners seem to be the primary pest of the plant and will damage the leaves with their feeding activity. Harvest lovage leaves at any time and dig out the root in autumn. 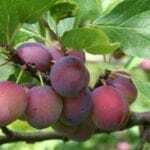 Seeds will arrive late in summer or early spring and the stems are best when eaten young. Lovage has a reputation as a good companion plant for potatoes and other tubers and root crops. Food crops should be arranged in the vegetable garden to form the best alliances and make their growth better and healthier.